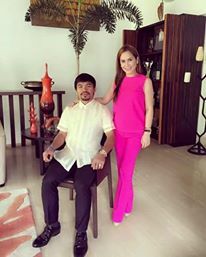 Manny Pacquiao is now a senator! Blessed is the man who stands for what he believes in as he is guided by the bible. Yes, he is a confessed sinner who finds life’s renewal in Jesus the Christ’s name. The senatorial race was never easy for him with many Filipinos not quite understand why he still want to be in public office – when he already has all the money and fame he needs. Also, he can even very well afford funding his own charities if serving his countrymen is what he’s up to. However, the majority of the citizens of the Philippines may not be that politically inclined as far as choices for public officials are concerned – but their hearts know best. Manny Pacquiao was vocal with his stand for the gay acts – but never condemned gays and lesbians. He is for death penalty as recorded in the bible but not without due process. He is for Binay all the way because he believes that the outgoing Vice President is innocent of the corruption allegations laid before him. BINAY….Brod I’ll Never Abandon You ….